To make salsa, you need a good recipe. If you don’t have one, don’t worry, I’ll share mine. Salsa is a staple around here, at least for my husband and son who like spicy stuff. The ingredients are easy to grow in your garden, and if you don’t grow them in your garden, they’re pretty easy to find at the market. Process 10 minutes in your boiling water canner. Now, for the step by step. First you need some tomatoes. Growing your own is vastly superior to buying them at the store for cost and quality, but do what you can. The good thing about this recipe is that it can be made with a few tomatoes or a lot of tomatoes. However many tomatoes you have, that determines how much of the other ingredients you’ll need. If your tomatoes are romas, wash them and cut the stem end off. You don’t need to peel them because their peels don’t separate when they are cooked. 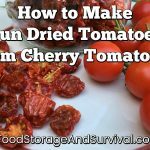 If they are another variety, follow the first few steps in the canning tomatoes post (up to getting the tomatoes peeled). Wow, missing a few pictures here. Anyway, after your tomatoes are prepped, pop them in your food processor and chop them to the desired consistency. Measure as you pour it out of the food processor and into the pot. The pot needs to be one that doesn’t burn stuff again. I like my pressure canner pot. It’s huge, so I can do a big ol’ batch of salsa plus it has never burned anything I’ve cooked in it. Next add the peppers. One bell pepper and one jalepeno pepper for each quart of chopped tomatoes. I usually have about 12 quarts of tomatoes, so I add 12 bell peppers. Core them and get all the seeds out. Then pop them in your food processor (yours is probably nicer than mine–I got mine from my mom when she got a new one–I’m pretty sure it’s 50 years old, but she says it’s probably only 30). Add the pepper chunks to your pot of chopped tomatoes. Now, if you like your salsa hot, go ahead and chop and add the whole amount of hot peppers. If you don’t, add about half that much and work up from there after it’s cooked for a bit and you can taste the hotness. I’m just shortening your learning curve here. Peppers from the store are not nearly as spicy as peppers from my garden. One year I didn’t grow jalepenos, so I bought some from the grocery store. I used 1 1/2 peppers per quart of tomatoes and it was perfect hotness for me. The next year I grew my own jalepenos. I put in 1 1/2 jalepenos per quart of tomatoes just like the year before and when I went to taste it before canning it, it was so hot my throat tried to swell shut. I about cried. I didn’t know what to do with that giant pot of salsa I’d been working on all day. I just wanted to throw it away and go cry myself to sleep (must’ve been one of those days, but I vividly remember how I felt when it was so much too hot). Anyway, sweet husband came home before I got so crazy as to throw it all out and he tried it and declared that it was perfect, so I canned it all up and he ate it. Thankfully I got another round of tomatoes and I did a mild salsa batch with it that year. So since then, I’ve stuck to the “half the hot peppers rule” and I’ll add more at the end if it’s not hot enough. It’s worked out pretty well. Another thing about working with hot peppers is that the pepper oil gets on your skin. I did not know this when I first made salsa. I cut the jalepenos and cored them by hand without gloves. Yeah, dumb. Don’t do it. My hands suffered chemical burns and I had to wear rubber gloves to take my contacts out that night so I wouldn’t burn my eyes. Now I wear gloves and just cut the tops off the hot peppers and throw them in the chopper without coring them. I know they’re hotter that way, but really, the less I have to contact them the better for me. This year we didn’t have jalepenos, but I had LOTS of these other hot peppers, so I used those instead. Turns out they are so hot that half the hot peppers was still too much. Ugh. Another pot of salsa for sweet husband this year. When the peppers are in the pot, add the onions. Quarter them and put them in the food processor and chop them to bits. I figure about 1 medium onion per quart, so if I have giant onions or smallish onions, I adjust the number accordingly. If you’re adding the garlic, toss them in with the onions so they’ll chop up nicely. My food processor doesn’t like chopping a few small things, it likes to have some volume to work with. Yummy. Now let it boil down. Stir it occasionally so you know how thick it really is because the juice comes to the top and the chunks kind of sink, so you might get it boiled down too far if you’re not stirring and checking the consistency. If you used romas, it won’t need to boil as long because they don’t have as much juice. Romas are really the way to go. I just didn’t grow any this year. When it’s boiled down to salsa thickness (however runny or thick you like your salsa) add the vinegar, salt, and sugar. We tried a little something different this year and substituted lime juice for the vinegar. You CAN substitute lime or lemon juice for vinegar in a salsa recipe, but you cannot substitute vinegar for lime or lemon juice because the vinegar is less acidic and you need a certain level of acidity to make the salsa safe. Then add the oregano, cilantro, cumin and cayenne pepper if you want it (I leave the cayenne out). My crazy little store didn’t have cilantro on my salsa day, so I used dry cilantro. Not quite as good as dried herbs usually aren’t, but it worked. Thanks to my mom for bringing me a whole bunch of cilantro that she grew and dried in her dehydrator so I have some for emergencies like this. You can taste your salsa once everything is in it–take a spoonful out and put it on a little plate or bowl and let it cool down. If it’s not hot enough, chop up a few more peppers. If it’s too hot, send it to my husband, he’ll eat it. Seriously, you could make more salsa without the hot peppers in it and mix the two together or something like that if you wanted to salvage your too hot salsa. I briefly considered that when I made that one crazy hot batch, but I didn’t have any more tomatoes at the time, so I thought I’d cry instead. Crazy girl. After it was all in the pot and I was happy with the flavor, I heated up the boiling water canner and a little pot with lids and filled the pint jars with salsa. Wipe the rims, apply the lids, put the jars in the canner and process for 10 minutes. Voila. Salsa. Yummy delicious too-hot-for-me salsa. :) I tried bottling it in quarts once (process 20 minutes), but we didn’t use it fast enough once it was opened, so we’ve stuck with pints. Contrary to canning tomatoes, this is definitely cheaper than buying salsa and much better tasting than any store salsa I’ve found. When I don’t make it too hot that is. Homemade salsa is by far much better and better tasting than the commercialized crap sold in stores. I bottle my own and sell it. The taste is night and day. Just checkout my salsa site if you wish. Wow. Just looking at your photos and reading your post makes me want to start my own big project canning salsa. I make it in small batches often, but I've never tried to can it before. Now I will.